I just wanted to reach out to you and say THANK YOU for all of your help preparing me to do well on my standardized tests. Before I came to you I was struggling getting my test scores into the upper ranges, but after I completed your video series, got feedback on my essays, and took more tests I got scores in the 99% for both the SAT and ACT. Ultimately, after the long and stressful college admissions process, I narrowed my two options for college down to Harvard and Yale, and I decided to commit to Yale University. Although I have always been strong in school and extracurriculars, I really feel like your assistance put me over the edge and played a role in my admission into some of the world’s best colleges. I have recommended you to many of my friends and teachers at school because I truly believe you are an amazing tutor with so much to offer. Thanks again so much and I wish you the best of luck in your future!" 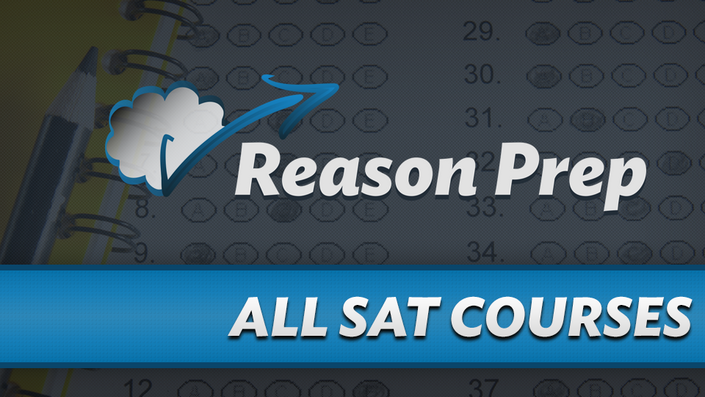 Get All Reason Prep's SAT Courses in One Bundle - Best Value! You'll also get access to special worksheets, study guides, and all future updates to the SAT courses for no additional fee. In addition, buying this bundle will grant you lifetime access to ALL future SAT courses on Reason Prep. There are no monthly payments, hidden fees, or future costs. In fact, if you have a suggestion for a course that might help you in your SAT journey, I might just use your feedback as the basis for future content! The core strategy for tackling reading passages in the most efficient and effective way possible. Key skills necessary for Reading mastery, including Paraphrasing, Identifying Trap Answers, Managing Time, Inference, and Attacking Hard Questions. How to conquer the dreaded Dual Passage Reading. What you should be doing with your pencil - and why not doing it can harm your score. When and how to read the passages, and the optimal order for attacking the questions (hint: doing them in order 1, 2, 3, 4... is almost always wrong!). How to identify the eleven trap answers that are ingeniously designed by the College Board to attract you to your peril, and how to avoid and eliminate them. How to manage vocabulary words and shades of meaning. How to solve the "two part" questions that require you to find specific lines of evidence in the text to support your answer to a previous question. These can be tricky! How to work through 40 real SAT Reading passages - watch me attack the passages question-by-question in real time. The ins and outs of the SAT Math section - question types, topics tested, and how it's scored. How to wade through the wordy word problems the College Board throws at you without losing time, getting frustrated, and missing easy points. A single powerful tactic that can turn even the trickiest algebra problem into simple arithmetic. How to turn the tables on the College Board by using their multiple choice answers against them. How to solve problems when you can't use your calculator, and how to take advantage of your calculator when you can. All the math content, formulas, and concepts you need to know to master this test. How to use these concepts to solve the most common question patterns that appear over and over again quickly and painlessly. The biggest mistakes students make when solving particular math problems, and how to avoid them. How to work through 8 real SAT Math tests (450+ questions) - watch me attack each and every question in real time. The two major question types - Grammar and Rhetorical Skills - and how to answer them with ease. The core strategy for tackling writing questions and passages in the most efficient and effective way possible. Critical writing tactics that will help you tackle even the trickiest question. The one word that almost always indicates a wrong answer. Every single grammar rule you need to fly through the grammar questions. The four principles that underlie correct answers to Rhetorical Skills questions. What to do when you get stuck between two choices that both seem right - only ONE is correct, and you'll learn how to identify the right answer and eliminate the wrong one. How to work through 32 real SAT Writing passages - watch me attack the passages question-by-question in real time. How to best prep for the Essay even though the College Board says it can't be done. the basics of the Essay: the instructions, prompt, and how it's scored. Big mistakes to avoid that would instantly crater your scores - and one strategy that can bump up your score all by itself. Exactly how to analyze the passage and write about the author's rhetorical strategies with thoroughness and insight. A core strategy and essay template that will work every single time - all revealed in the downloadable cheat sheet. In addition, I work through an entire practice essay from start to finish so you can see how to implement the strategies and steps to a 4/4/4. Unlimited essay grading. Just send me your SAT Essays and I'll give you a score and specific feedback on how to improve. Access to Worksheet Solutions. I create free, customized worksheets for the SAT here. This course will give you access to video solutions for ALL currently available worksheets and ALL worksheets I create in the future. "Mr. Schombs has been a great tutor, mentor, and teacher over the course of time. His content and way of teaching is really helpful and unique. I have improved about 200-250 points on my SAT by using the material on Reason Prep and by also having detailed one-on-one conversations through email. Mr. Schombs offers a lot of ways for him to give you the feedback you need in order to understand what you need to improve on. Furthermore, he gives each student the time he/she deserves in order to excel on the SAT. Along with standardized test prep, he does a great job giving adequate advice for higher education. If you follow the videos and advice he gives, I’m sure you will see big gains in your score. Reason Prep is amazing!" Video solutions to every Reason Prep worksheet. The course comprises 35 hours of video content over 300 lectures. If you work for an hour per day, you should be able to complete this course in about two to three months. If you work for two hours per day, you should be able to complete this course in about 1.5 months. This is Andrew, a student who signed up for your online SAT course. So the SAT scores just came out today and thanks to your SAT prep course videos, I hit my targeted score exactly! I got a 1550 and an 8/8/7 on the essay. I've went to many SAT prep centers and none of them helped boost my scores as much as your videos did, especially the essay portion. Last May, I only received a 1450 and a 6/4/6 on the essay, so this was a huge improvement for me. I was just extremely satisfied with my score and all your help, so I wanted to let you know that I really appreciated everything that you did to help me, and I will definitely be referring all my juniors to your SAT Prep Course! Thanks again! I've distilled down all my SAT knowledge into these videos to give you the most comprehensive and effective SAT video courses you'll find anywhere. The one-time fee is less than what you would pay for one hour of my time. And you're getting EVERYTHING - all my knowledge, all the tips, tricks, and strategies. I'm not holding anything back.